This is what we found while looking for a few Pansies to augment some of the containers at work. I fell for the streaky purple coloring and fresh smell of ‘Columbine’. Overall I would have preferred Pansies because of their larger showier flowers but only Violas were ready at the nursery. It was nice to see they were offering (this is a grower) several different types for a change. We also got a flat of dark purple/white Viola and they seemed to compliment the lighter ‘Columbine’ flowers nicely. Since I have a virtual mountain of work email to send out this post is going to be a little short. There is also a mound of paperwork that has to be dealt with. Get me back to the garden where I am more comfortable, please. When the word viola is mentioned, I think of two things – the musical instrument viola and the flower viola. 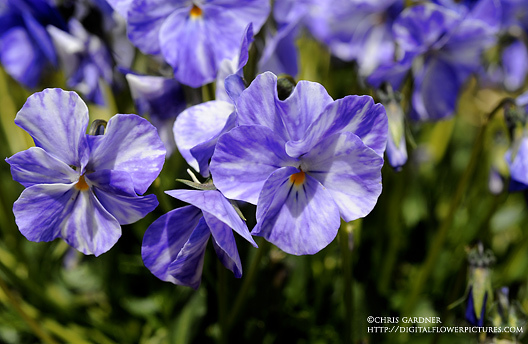 The color of the viola flower is of course a “soft” violet.